Due to the lack of space, this sump was built in two parts so it could be installed more readily. 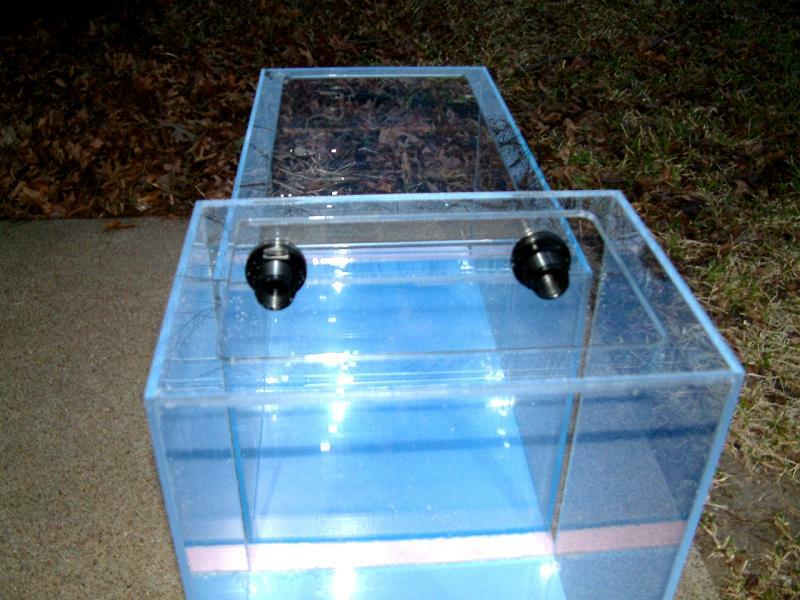 The skimmer and return zone are in the shorter sump, and the taller vessel is the refugium. 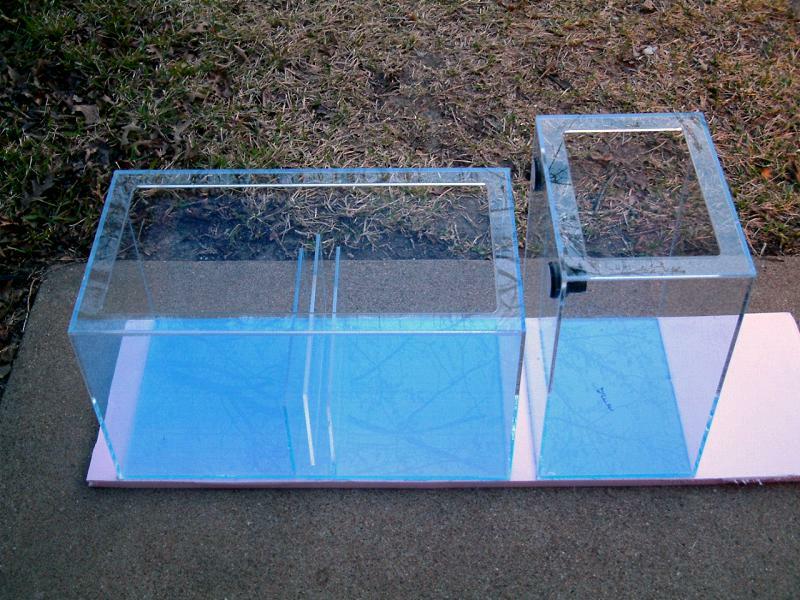 The sump is 28" x 14" x 14"( or 23.8-gallons) and the refugium is 10" x 14" x 18"( or 10.9-gallons). When running, the combined volume of both parts added up to about 23g of water. 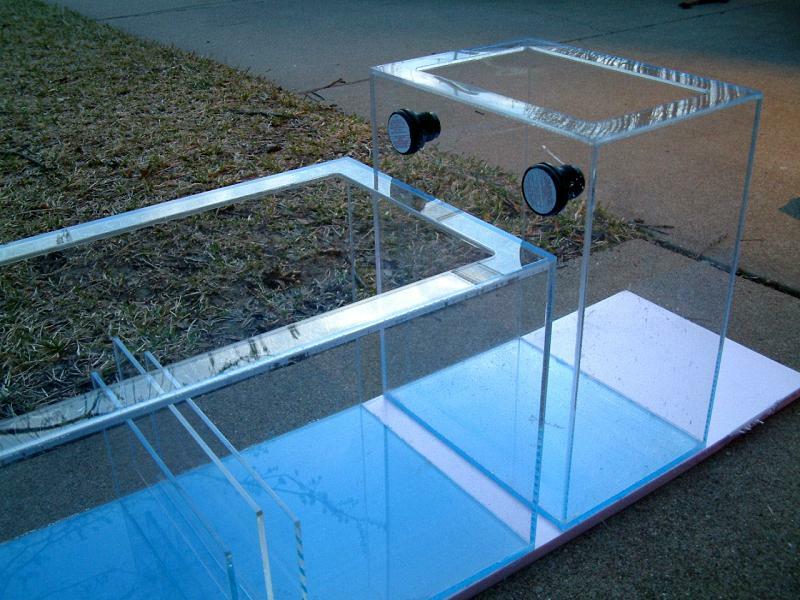 The refugium was inserted in the stand first, and moved as far to the side as possible. The sump was inserted standing on end, then rotated into position. Once this was done, it was plumbed. The skimmer went in the left end, the return is the "middle" of this layout. Two bulkheads were designed for this taller refugium, mainly to handle the flow if one were to clog for some reason. These were plumbed so that the pipes would drain in the bubble trap to avoid microbubbles in the return area. The sump was quite narrow, due to the stand's restrictions. 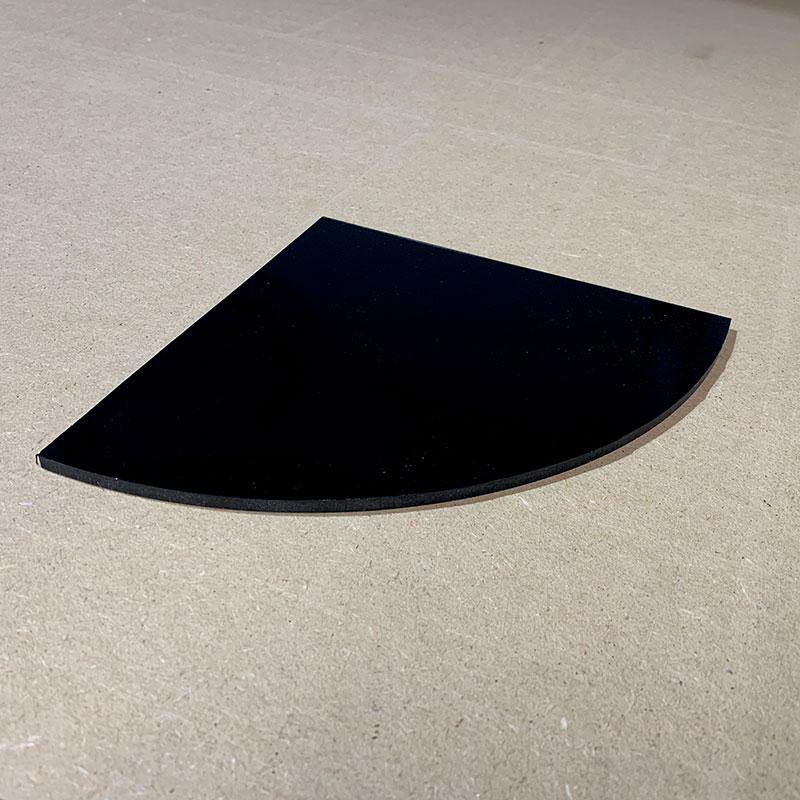 Since each unit was small, the flange (top edge) was kept to 1.25" wide for easier access. Hi Melev, I am currently diving into a new sump design with a algae refugium. I have learned that in the beginning (first month or so) I should also run a skimmer as the refugium needs time to grow in order to reduce enough phosphates and nitrates. I had a friend from the US get me to fly in a Kessil H80 lamp. Thing is that an algae refugium should be as big as possible. However, my stand is small as my aquarium is only like 30 gallons. 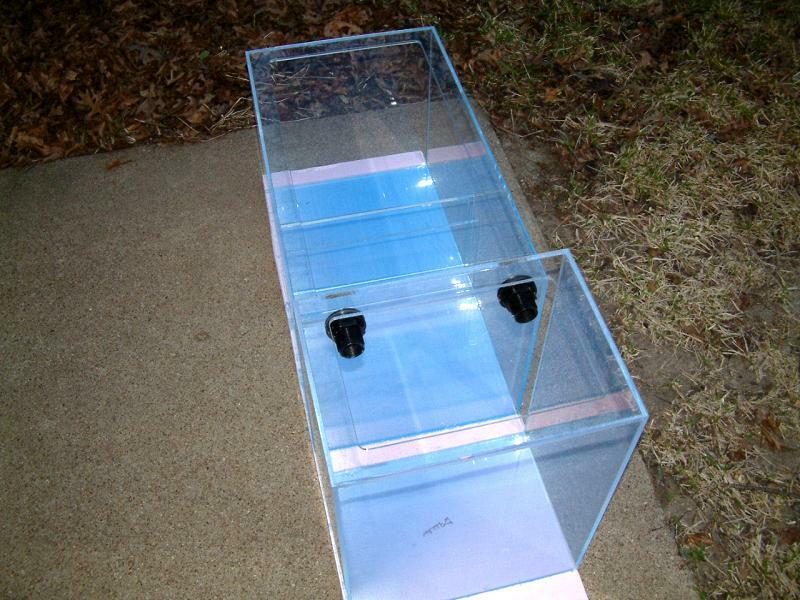 I built the stand myself and had a sump being made but now I doubt whether this will do the trick and whether I should have an extra refugium on top of my sump from which the water pours down into the sump with my skimmer and return pump. Here on your site I found your article about the I sump, which comes close to the one I am thinking about. However, I don't understand it...The taller one is the refugium (the accompanying text suggests otherwise but later points to this being true) from which the water flows to the sump underneath. Do you have any photos of this setup in a working condition? I hop you understand what I mean. Yours, Martijn van Beek the Netherlands P.S. : have a great reefing year! Posted 2 hours 57 min ago. Posted 5 hours 44 min ago.